The Civic Secure Identity Platform (SIP) is an identity verification platform (IDV) that operates on the Ethereum blockchain. The Civic Platform aims to create a cohesive encrypted information sharing system that allows users to submit their personal identification information onto the civic platform, where it is then stored and shared by the user as needed. This user can be either a private individual or a larger registered entity such as a business. In turn, service providers and institutions can also register for access to the data stored on the system, once the encrypted information has been shared with them by the user. It is also noteworthy that the institutions will not have access to all of the user’s data, but rather to an authentication key that verifies the user’s identity. The SIP platform operates via a mobile app called the Civic App (short for Civic Secure Identity App) thereby allowing for convenient operability. Firstly, the user will be required to input their personal information into Civic’s SIP App, and then await verification and approval. Once approved, the user’s credentials will be recorded, encrypted and distributed for storage on the Civic Platform. End users who are registered on the Civic Platform will then be able to retrieve authentication data from users by, such as banks, hotels and airlines by means of an encrypted QR code peer-to-peer data exchange mechanism. Users can also verify their information directly with the recipient by using their mobile app to project a bar-code that can be scanned by the recipient. This can be combined with fingerprint recognition that can be programmed as part of the authentication code. Users can view and edit the information at any time. Validators are the intermediary nodes that are responsible for the collection, encryption, storage and distribution of encrypted user Personally Identifiable Information (PII). Only trusted institutions will be selected to participate as validators, such as government and financial institutions. Once the validator has verified a user’s ID, they will then encrypt this data with a unique QR code. This data will then be known as an ‘attestation’. 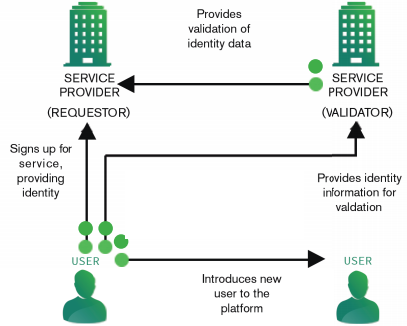 When service providers apply to access information, their request will automatically be sent to a validating node, which will then verify the data in the QR code and proceed as necessary, depending on whether or not the code is approved. In order to guarantee that no single institution forms a market monopoly, Civic will allow for many validators to offer their attestations to service providers, thereby ensuring that transaction prices remain fair. Civic itself will not retain any PII, but rather acts as the ecosystem in which all actors can connect and interact with each other. Transactions can only be finalized with the approval of all three parties, namely the user, validator and service provider. This Civic Platform is being created to enable users and institutions to perform data transactions through an end-to-end encrypted information exchange system, which is designed to ensure that their data is less vulnerable to cyber-attacks, misuse and mismanagement. When using the platform, recipients can request the specific data that they would like to have access to. This will be encrypted in the QR code that will then be received by the user. The user can then accept or reject the request. If the request is accepted, the data will automatically be sent to the recipient by means of an encrypted QR code. This will allow users to register for various services in a secure manner without the need to re-enter their personal data multiple times and will also make the process less resource-intensive for institutions, as know your customer and IDV processes will be automated and instantaneous. 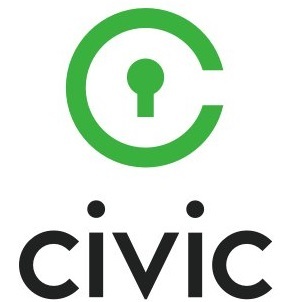 Civic envisions that the low registration and resource costs incurred by their platform will be particularly useful to individuals whose socio-economic situations and geographic locations currently limit their ability to register for identity numbers and therefore other institutional services as well. Automated transactions result in the removal of intermediary fees. The distributed ledger data storage mechanism allows for a consensus algorithm to be implemented, thereby reducing opportunities for external tampering by bad actors. All transactions are transparent to all nodes on the network. The encrypted transference of data allows for user anonymity. All transactions are permanently recorded and traceable. CVC will be used as a form of remuneration for validators by service providers in exchange for providing them with attestations. When attestations are sent to service providers, the users will also receive CVC as an incentive for participating on the platform. CVC can be used to purchase various other services offered by Civic, such as the Civic App which allows users to store their own PII securely on their mobile devices and personal background checks. If they wish, users can also transfer their PII to third party storage platforms at their own discretion. March 7, 2018 – Votem partners with Civic to implement Civic’s KYC technology during their token sale. February 14, 2018 – Loyakk partners with Civic. January 27, 2018 – Civic launches their Reusable Know Your Customer (KYC) service for service providers. October 12, 2017 – Civic SIP platform is launched. As of 2 February, it was still undergoing bug fixes, as there are certain devices that it is not yet compatible with.